This Saturday (Saturday of the fifth week of the Great Lent) we chant the Akathist Hymn during Matins. In our days however this does not happen except in the holy monasteries, since in the parishes it is chanted the evening before, on Friday during the Small Compline. The Akathist Hymn is a “Kontakion”. In olden times a Kontakion was a series of hymns, analogous with a “Canon”. The name probably comes from the short stick with which the parchment that contained the hymn was unwrapped [kontakion means “short stick” in Greek]. The first troparion is called a “prooimion” or “koukoulion” and those after are called “oikoi”, hence why the entire hymn is considered an entire structure [oikos in Greek means “house”] dedicated to the memory of a certain saint. Today the first troparion of such a hymn is usually called a Kontakion. The Akathist Hymn contains a prooimion and 24 “oikoi”. The prooimion in the olden days was not where “O Champion General” is today, but after (“When he perceived what had secretly been ordered”). The “acrostic” of the hymn is alphabetical, that is it follows the order of the alphabet [in Greek] A, B, C, D, etc. An acrostic is a phrase that is formed when the first letter of an eirmos and troparion continues in a certain continuous order for a hymn. This phrase sometimes refers to the name of the author of the hymn, or at other times to the subject of the feast, and so on. Of course not all hymns have acrostics. There are also two “Ephymnia” [Refrains] in the Akathist Hymn: “Rejoice, Bride unwedded” and “Alleluia”. The first is the response for the odd numbered “oikoi” (1, 3, 5, 7, etc.) and the second is for the even numbered “oikoi” (2, 4, 6, 8, etc.). An “ephymnion” is the last word or phrase of a hymn which the people repeat, since the chanters of course chanted the entire hymn. The Akathist Hymn begins with the Annunciation of the Virgin, and then refers to the events thereafter. It speaks of the visitation of the Virgin to Elizabeth, of the suspicions of Joseph the protector of the Virgin, of the veneration of the Lord by the shepherds and magi, of the fleeing of Christ to Egypt and the Presentation of Christ in the Temple. These are in the first half. 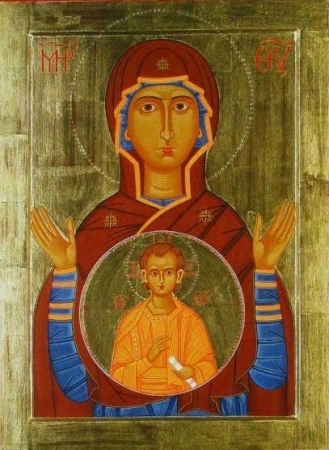 In the second half of the Hymn are words about the incarnation of Christ, the theosis of mankind and the worthiness of the Panagia to be the Mother of God. 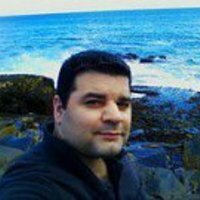 Who was the author of the Akathist Hymn? To this question there has not been given an answer till this day which would not be disputed. Despite all the research and discussions the problem remains a problem. Some – and these are the majority – theorize the Hymn was written by Romanos the Melodist. 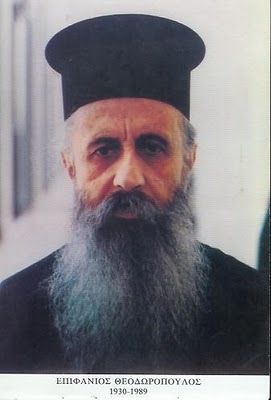 Others theorize it was Patriarch Sergios of Constantinople. Others bring forward George Pisida, while others bring forward others. What seems most likely is that the Hymn was composed during the reign of Emperor Justinian, if not even a bit older. About the year 626 Constantinople was beseiged by the Persians and Avars for some months. Emperor Heraclius at the time was in Asia Minor battling the Persians. When he found out his city was beseiged he sent 12,000 men of his soldiers to the patrician Bonos in Constantinople in order to defend, with the patrician, the capital of the empire. Bonos along with Patriarch Sergios gathered as many citizens as possible with weapons. They all swore to fight till the end. The Patriarch was running around the city encouraging the people and the fighters. 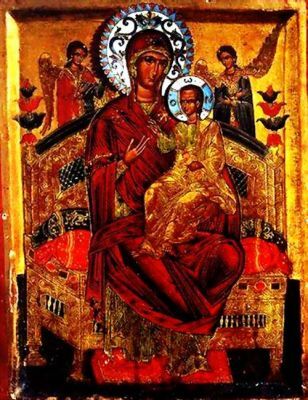 The entire city placed their hopes in their Protectress, the “Champion Leader”, the Most Holy Theotokos. The seige was near and strong. Despite this the city withstood the attacks of the seige, yet the seige persisted. Suddenly a fearsome hurricane broke up all their ships, and they rushed throughout the night from the 7th till the 8th of August to abandon their seige and leave empty-handed. The kingdom was saved! The people of the city, celebrating their salvation, which they ascribed to the Mother of God, assembled at the Blachernae Church of the Theotokos, where they gathered for an all-night vigil of thanksgiving, presided over by Patriarch Sergios. During this the entire crowd chanted the Hymn while standing, and from this time on it became known as the Akathist Hymn [akathist means “not sitting” in Greek]. 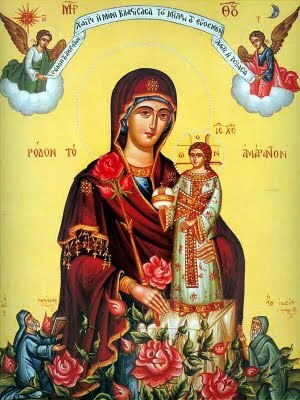 Indeed the Hymn existed before this time and was chanted to the Most Holy Theotokos, but on that night it was established in a festive way for our Church. The troparion “O Champion General” (which replaced the pre-existing “When he perceived what had secretly been ordered”) was unquestionably composed at that time. For this reason the entire deliverance of the city from clamity “ascribed the victory” to their Protectress the Theotokos. The Akathist Hymn begins with a particular Canon, which begins “I will open my mouth”. This is an even numbered Canon, which means that it has eight Odes. The acrostic says: “Giver of joy, to you alone belongs rejoicing. Joseph.” The name Joseph refers to the author of the Canon. This is probably Joseph the Hymnographer, who was from Sicily and lived during the ninth century. The eirmoi do not belong to him, but were from the Canon of the Dormition of the Theotokos. They probably belong to John the Damascene. Every Ode in the Canon has an eirmon and four troparia. Thus the Canon has 8 eirmoi and 32 troparia. This Canon is most beautiful and festive, and characterized as a poetic masterpiece. It sings of the Ever-Virgin Daughter as “the living book of Christ”, as “the palace of the only King”, as a “fiery throne of the Almighty”, as a “treasury of purity”, as a “sweet smelling lily”, as a “dwelling place of light”, as a “mercy seat for the world”, as “higher than the heavens”, as “incomprehensible depth”, as “height unspeakable”, as “the bridal chamber full of light”, as “the fiery chariot of God the Logos”, as the “living Paradise”, as “the cause of all the deified”, as the “unconsumed bush”, as the “mystical rod”, as the “pillar of fire”, etc. The Akathist Hymn is also chanted in sections in our churches in the first four Fridays of Great Lent. The entire Canon which accompanies the Akathist is also chanted on these Fridays. When he perceived what had secretly been ordered, to the abode of Joseph urgently reported the bodiless one and said unto the Unwedded: The Lord who has bowed the heavens in His descent, in you is contained completely and without change; and be­holding Him in your womb taking the form of a slave, astounded I cry out to you: Rejoice, O Bride unwedded!